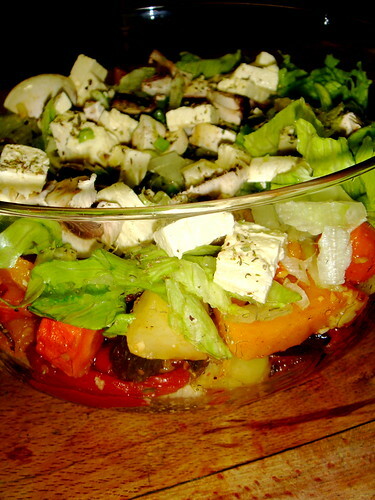 This is a great salad at this time of year when you have a heap of visitors coming over… You can make this hours in advance and simply forget about it. The longer you leave it resting the better. And you can use whatever ingredients you have lying around… no specifics apart from the couscous! 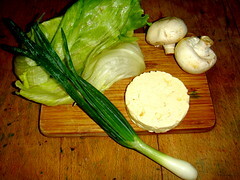 Also, my kids love this salad because its chunky and they can pick out the bits they don’t like! 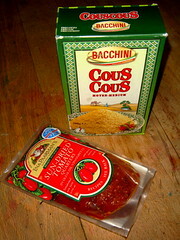 Some couscous and sun-dried tomatoes in vinaigrette. Any roastable vegi’s you have lying around. 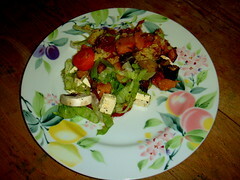 Any salad green’s as well – I would have added tomato’s in this step but the tomato thief had been. Olives are also good but we have an olive thief as well! Step 1: Make the couscous, this is so easy its laughable and if it isn’t in your cupboard as a regular three minute add to any supper kind if of a thing, then it should be. So equal parts couscous and boiling water. Step 2: I used a cup of couscous and so a cup of boiling water. Add the cup of boiling water and leave it to stand for about three minutes. 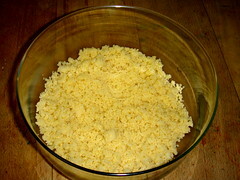 The couscous swells to fit the water. Step 3: Add a nob of butter and stir it through with a chopstick (or a fork or whatever!). You will end up with a yummy bowl of couscous. 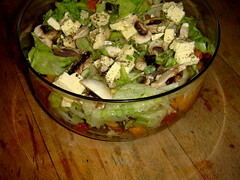 Step 4: This salad cries out for a glass bowl, because of the layers. But if you are having thirty of your best friends over for a meal then a great big flat platter works well as well. 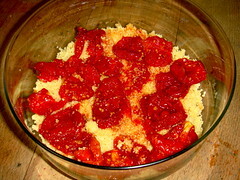 So spoon the couscous into the serving dish and pour the sun-dried tomatoes over it. the vinaigrette is important. It sinks into the couscous and adds to the flavor. Leave this aside to rest and soak away. 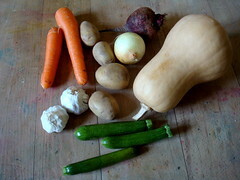 Step 5: Chop and peel all your roastable vegetables. Whole garlic cloves are brilliant in this. So are peppers: red, orange, yellow, green. Really you can use anything. 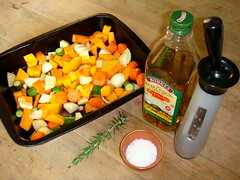 Add on lashings of olive oil, salt and pepper and we always add fresh rosemary. 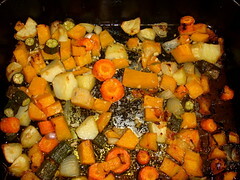 Roast away – I put my oven on 200 degrees celsius and they take between 45 minutes to an hour to roast – depending on how many vegetables you are cooking at the time. They are done when they are soft but not yet squishy, when they are starting to turn brown and crispy. Place your vegetables on top of your couscous and sun-dried tomatoes and scrape all the pan juices in too. Leave them to stand and let the juices seep through. Step 6: When your vegetables and couscous have completely cooled take your salad greens and just as if you were making a regular salad chop and slice and dice and place this on top of your vegetables and couscous. 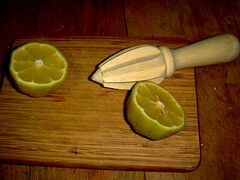 Step 7: Squeeze lemon juice on top to keep it crispy and you are good go. Hi LaVonne Thanks for stopping by!!! 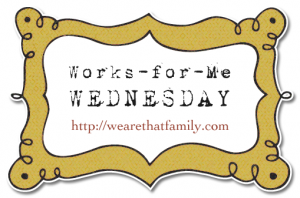 Have a good week!! !